These candle hoders are 16 oz deep wrapped in twine, with a cute bow on the front. 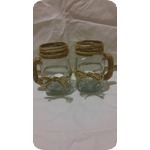 This set comes with 2 candle holders, 2 candles, and clear glass gems. 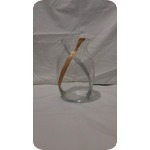 8 inch glass flower vase with a silver accent spiraling down it. This glass flower vase is 7 inches tall with beautiful silver and gold accents. 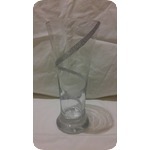 These elegant glass candle holders are 16 oz deep with beautiful silver accents and a white ribbon that wraps around it. 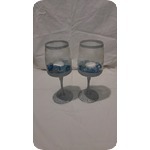 This set comes with 2 candle holders, 2 candles, and blue & white glass gems.